There’s a buzz in the roofing industry around the concept of green roofing. With property owners becoming more aware of the environment and wanting to do their bit while saving cash by reducing energy, green roofing is becoming increasingly popular. Green roofs are exactly that – they are roofs that are covered in green vegetation. They offer many benefits. They are easy on the eye, particularly in dense urban areas, and are an attractive way to make the most of the neglected space on your rooftop. Green roofs have long been in use across Europe. In fact, in Germany, 14% of all roofs are green. But now this phenomenon is being embraced in the UK. In fact, several London borough and local authorities are backing the green roof campaign and plans to renovate an area of east London makes provision for 40% of the buildings to have a green roof. There are so many benefits to having a green roof that it’s hard to imagine why this type of roof is not more prevalent in the UK. Green roofs last longer than traditional roofing as they naturally protect your roof from UV rays and harsh weather conditions. They offer natural insulation, keeping out sound, and can be energy efficient by insulating against the heat of summer and the cold of winter as they tend to remain at a stable temperature – so your property is kept at the perfect temperature all year round. What’s more, they absorb rain water, which takes the pressure off your drains and the wider drainage system in your locality. Environmentally, green roofs can improve urban areas considerably. An alternative to black tar and asphalt rooftops that radiate heat, green roofs provide an attractive retreat for city dwellers on a scorching hot day. They improve air quality and provide a remedy for trapped heat, which is often a problem in built-up inner city areas during the summer. A green roof can not only help to reduce this unbearable heat but will also help add extra oxygen. They absorb carbon dioxide and other pollutants, making them the perfect antidote for those days when you’re literally gasping for air in midst of a bustling city. An additional benefit is that a green roof will provide a sanctuary for wildlife, making for a more pleasant environment all round. There are two types of green roofing available. One is more complex and doubles up as a kind of roof garden, with shrubs, trees and paths. 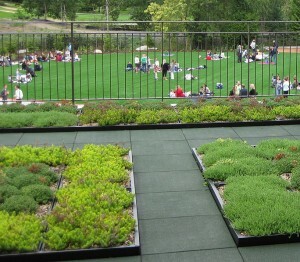 These are called intensive green roofs. They require some planning to ensure that there’s adequate irrigation and drainage, plus enough space for layers of protection for the roots. They also need to be assessed to make sure that there’s enough structural support. A less complicated type of green roof is called the extensive green roof. These require relatively little maintenance and weigh less than an intensive green roof. These are usually not used for rooftop walks but are simply used as a roofing system that will offer good protection, insulation and environmental benefits. At the moment, green roofing is more expensive than other traditional roofs as they need careful planning and design. But the UK is fast beginning to see the benefits of green roofing and in the future, these fantastic roofs could well become something of a common sight around the British Isles. If you need advice about roofing roof, contact a professional roofer. G&A Roofing and Building has been established for over 25 years and is a leading roofing firm. We provide a range of services including emergency roof repairs, roof window fitting and repairs for all types of roofs including flat roof work. We would be happy to talk through all your options with you. Call our friendly team to discuss your requirements on 0800 626430.